I intend this layout to be in the BR blue era-1970s-late 1980s-my first purchase being a blue/grey HST. Wow! well done, Noel. I always liked the BR blue era. Looking at the scenery, it wouldn't be difficult to make it "Irish" too - given an accumulation of the right sort of stock. At that scale, one might better get away with repaints of BR things if pursuing that route. My first experience of BR was that very interesting period when steam was only finished some 18 months and all manner of weird types of diesel locos and railcars - as well as the odd wooden dining car - was still operating. 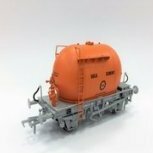 Locos could be green or blue, carriages maroon or blue / grey. I was just turned 13; life was good..... as was a North Wales lineside holiday in an ex-LNWR camping coach! Lovely looking layout! Best of luck with your new purchase! Ah, the 'unexpected purchase'! Very nice Noel, looking forward to seeing it develop. No doubt it will be a worthy companion to TJ2. 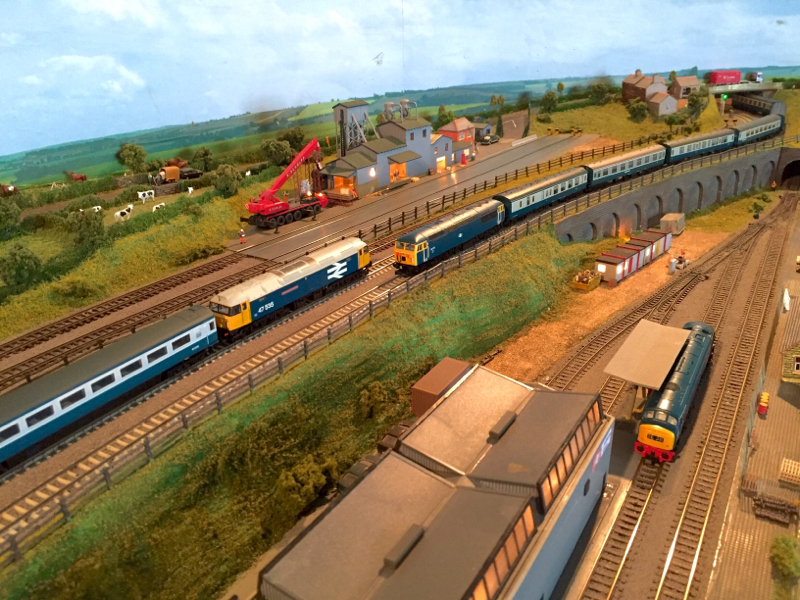 Congrats here Noel on a beautiful investment - a fine layout indeed. 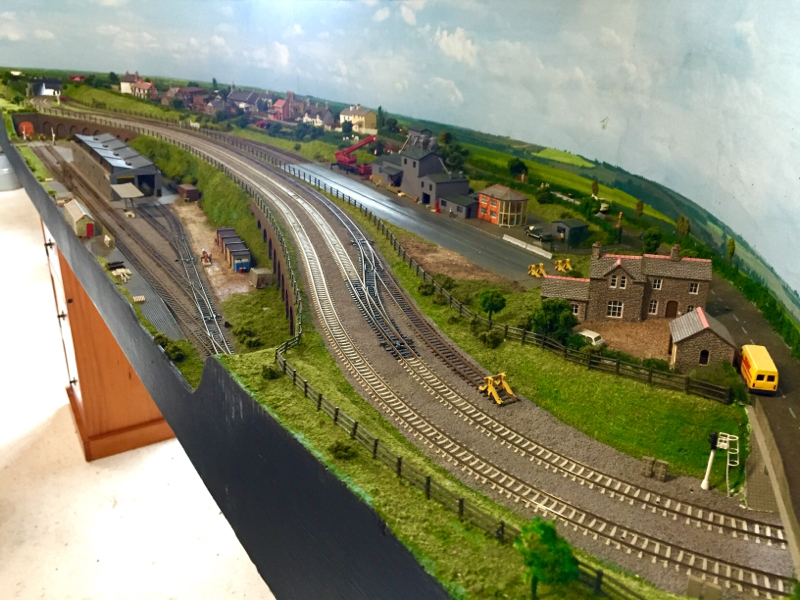 Nice one Noel, have seen the layout in action before and it's lovely. Welcome to the dark side! Best of Luck with it Noel. A Layout I've admired for the past few years-ya beat me to it!!! Best of luck Noel with new layout. Lovely looking layout Noel,congrats on your purchase,enjoy it! Thanks lads for your comments-it's much appreciated, At the moment I'm familiarising myself with the layout,which I'm enjoying, My first purchase was the iconic blue/grey HST, Here is a staged shot of it passing the freight depot and down loop-a five piece formation as I'm waiting for a TGS and buffet car to complete the rake. Absolutely top notch Noel,HST looks mega and the curve of the backscene is brilliant. 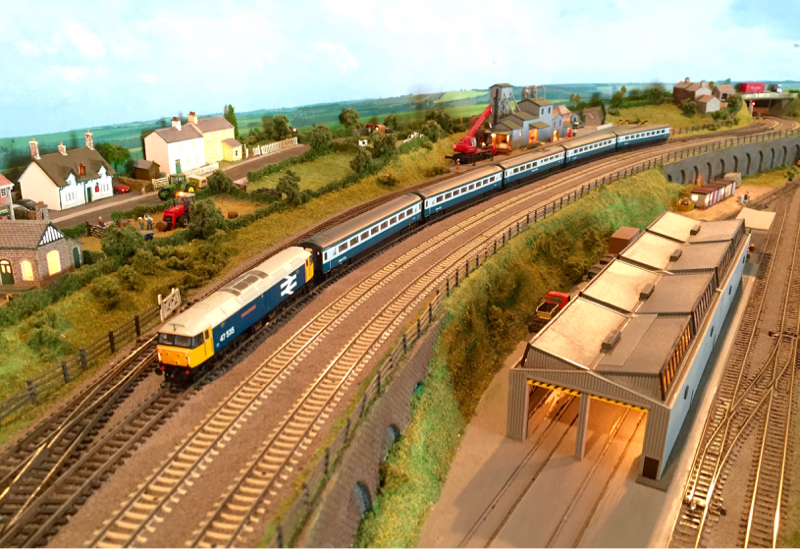 A fantastic view of the HST and layout. The plan is to have an 08 shunting the yard while some passenger and freight will be passing on the main lines with some loco movements taking place in the MPD. Lovely shot Noel, is that code 55 track? Hi Dave-I'm not sure,maybe one of the Wexford lads can confirm,as it's all new to me. Jeepers Noel,keep posting up shots like that and we will all be converting to BR blue and N!! 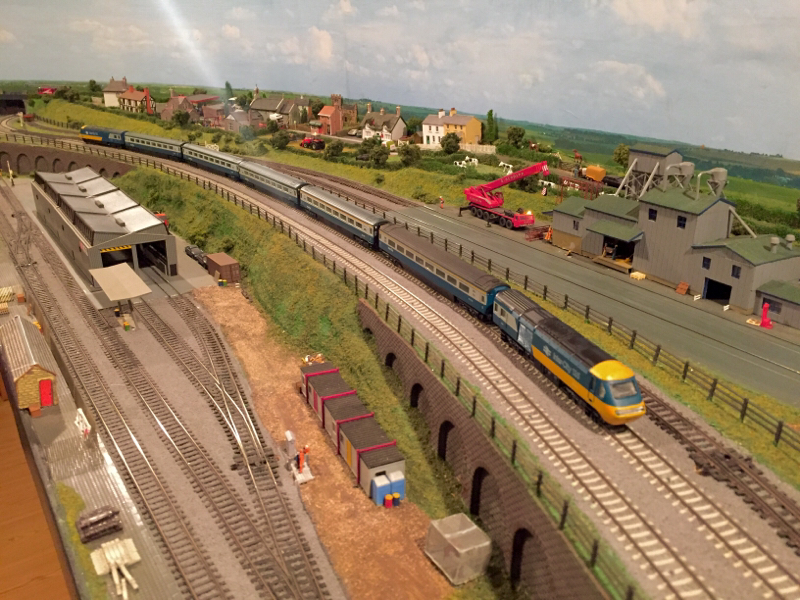 The HST looks great in N as you can run a full rake and not have it entering the leaving the scenic section at the same time as you would in many 00 layouts. Please post some more pictures when the final coaches are added. On the fuelling point is Class 46- 46001. Looks great.I love the 47 with large logo (I have one "preserved" on Llangollen, well thats my excuse). The HST set has also been increased with the inclusion of a dining car-3rd coach from the front. Looks really well Noel. 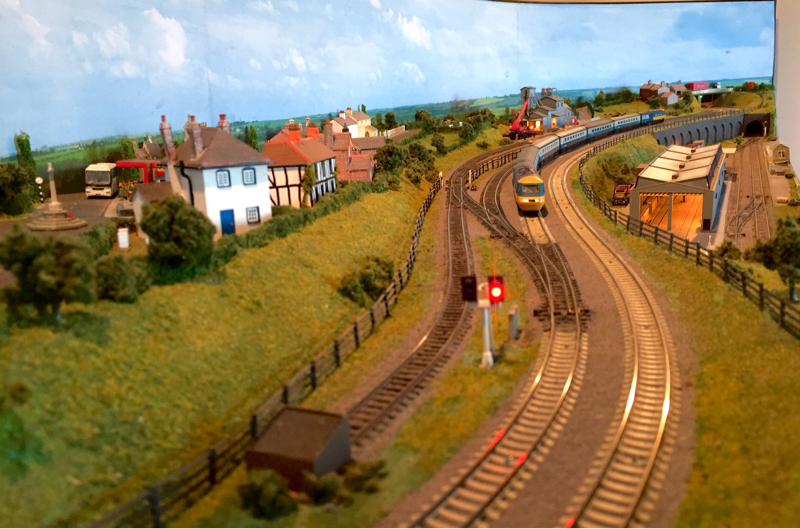 N gauge really suits modern image with long scale length trains and gentle track bends that look authentic. That iconic HST 125 set brings back happy memories during the 80s travelling frequently from Paddington to Temple Meads. Love the new arrivals Noel. 47 535 arrives into the up loop with a Mk3 test train, It will run around its train here when traffic permits. In the meantime a London bound HST races by. 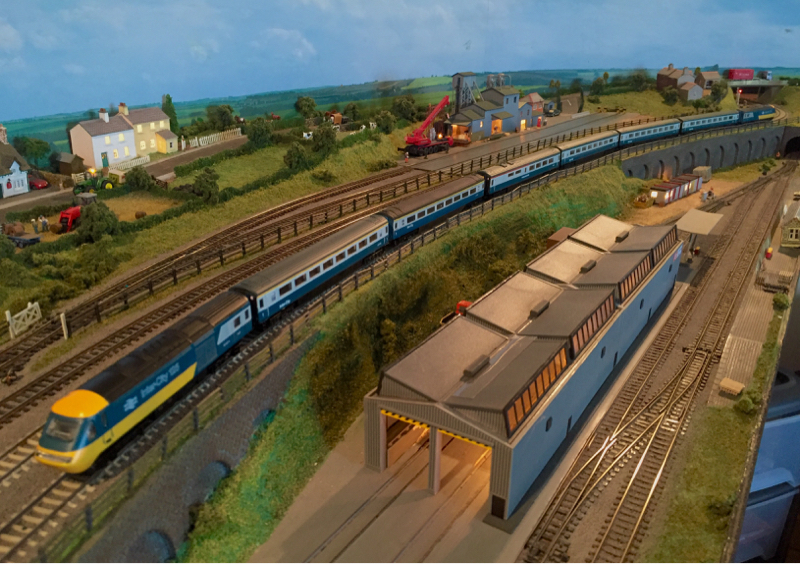 Any chance of a look at the fiddle yard? Are the lower and upper levels connected or are they completely separate?